BC Hands & Voices and Guide by Your Side’s 2017 Fall Parent Workshop was a great success! A glimpse into the crystal ball – the perspective of teens & pre-teens who are growing up “Hands & Voices.” Relationships, language considerations, challenges & more! 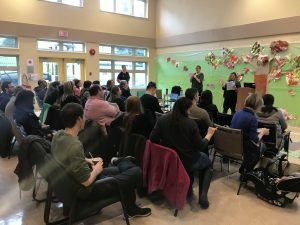 About 40 parents came out for our workshop this year to learn, socialize with other parents and have the opportunity to meet Deaf/Hard of Hearing Guides and adult role models. Morning presenters Teresa Kazemir, Joy Santos and Kim Shauer shared some of their experiences developing their “parenting a deaf/hard of hearing child” perspective in a presentation originally developed by Leanne Seaver and Janet DesGeorges, founding members of the Hands & Voices organization. 1) Is the behaviour a direct result of or influenced by access or communication? 2) Do I need to re-evaluate what my instinctual response was going to be? Parents learn this sensitivity and awareness from a variety of places including their ‘new’ parent community, Deaf and hard of hearing adults/role models, and professionals. Parents also develop these skills over time from experience – when children act in unexpected ways that can be socially out-of-synch or even inappropriate, the first thing we should look for is communication breakdown. Be pro-active and actively teach world knowledge that your child may not pick up through incidental learning or “overhearing” some background information. Babies and toddlers wonder where parents go when they leave the room (they may not hear where you are in the house), and can have anxiety over when a parent is coming back. To help reduce anxiety, share with your child what you are doing, where you are going, when you’ll be back. This also presents an opportunity to learn language in various ways – sign, tell, show a photo, have child touch an object cue (e.g. spoon for kitchen, hand towel for bathroom). Check for comprehension (tell me what you understood). Then fill in missing information and correct misunderstandings. Our first instinct may be to take a toy away if not sharing – but first examine if the child understood the concept of turn-taking and sharing. “Never mind rule.” A D/deaf or hard-of-hearing person may tell you that the most annoying thing they hear on a regular basis is “never mind.” This can be very frustrating, not only because of missing out on information, but also because it sends the message that the D/deaf or hard of hearing person is not worth the extra effort. Even if the comment or joke has passed, it still needs to be explained. Anticipate potential communication access challenges; be proactive to make accommodations and then fill in any gaps that arise. Have high expectations and periodically ask yourself, “Is this typical, age-appropriate or developmentally-appropriate for my child’s level, considering additional challenges?” Ask your early interventionist who to talk to if you have concerns, and take action! The afternoon session of the workshop, moderated by Jen Gow, was a definite highlight for attendees, with a glimpse into the future shared by a panel of parents, children and teens. The panelists represented a range of hearing levels, hearing equipment and access preferences, and school settings. 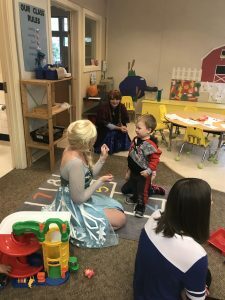 The children and teens shared how they answer questions about their hearing aids or cochlear implants and how they were encouraged to answer these questions from other kids in a positive, matter of fact way by their parents from an early age. The children and teens on the panel also shared their interests in a variety of extra-curricular activities, including softball, dance, basketball, reading and Xbox, and they shared what strategies and adaptations work for them to thrive in these activities. For example, Kacie uses secret hand signals and numbered plays on the softball diamond, Caitlin reminds her dance teacher to move so that she can better see what she’s saying, and Michael uses various communications strategies depending on which basketball team he’s playing for. Challenges can of course arise and some days can feel particularly difficult. The majority of the “bad days” shared seemed to involve a change to daily routines, dead batteries, fluctuating hearing levels or missing out on a social experience due to access. When these types of things occur, the panelists shared the importance of self-advocating, of having other deaf/hard of hearing friends in their lives to sign or chat with, and of having activities (such as dance) that make them feel confident. It was interesting to see some of the kids shift between signing and speaking, and describe how their chosen modality depends on their communication partner, their environment, or whether they had food in their mouth! Overall it was obvious that these young people are clear communicators in a variety of modalities and are building a healthy resilience as well as skills that will serve them well through life. Parents on the panel shared that it takes practice to learn to advocate for your child and to teach your child to advocate for themselves, but that it’s very important. It was great to see that even the youngest panelists have no issues telling their hearing friends “get closer to me”, “look at me and say it again” or “step back from my face, you’re talking too loud!” Parents also shared stories of the importance of building connections with other deaf/hard of hearing peers, especially when a child is the only one in his or her school with a hearing difference. Altogether it was clear that the parents are working hard to encourage their children to feel limitless in terms of their potential. The confidence that these children and teens have, as well as their useful tools and strategies have obviously come from positive modelling and an overflowing amount of love from their parents, role models and other positive influences in their lives. BC Hands & Voices would like to extend a big thank you to the BC Early Hearing Program, Children’s Hearing & Speech Centre of BC for the use of their beautiful facility and to Deaf Children’s Society and Children’s Hearing & Speech Centre of BC for providing professional childcare staff. A special thank you to the Elsa and Anna, signing princesses from Storybook Dreams Parties for their exciting visit to the children in the childcare room. And as with all events such as this, we recognize and appreciate the many hours put in by board members and volunteers, our presenters and panellists. Thank you everyone for your time and hard work. Your contributions all helped to make the Fall Workshop 2017 a big success! This entry was posted in Articles, Deaf Culture, Events, Families to Families. Bookmark the permalink. Follow any comments here with the RSS feed for this post.